The competition BBQ community is small and tight knit. A lot of competitors have restaurants or run catering businesses. 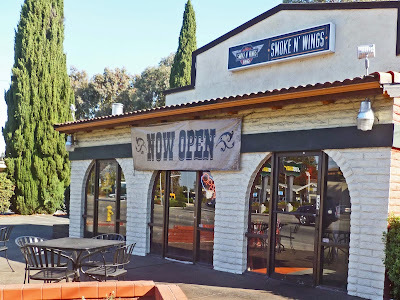 Mark Brown from the competitive team of 'Wine with Swine BBQ' runs and owns a small bbq restaurant in San Jose, California called 'Smoke N' Wings'. We have met Mark at numerous competitions and are excited to try his smoke palace. 'Smoke N's Wings' is housed in a familiar past 'South of the Border' fast food abode. We open the doors and are immediately greeted by Mark. 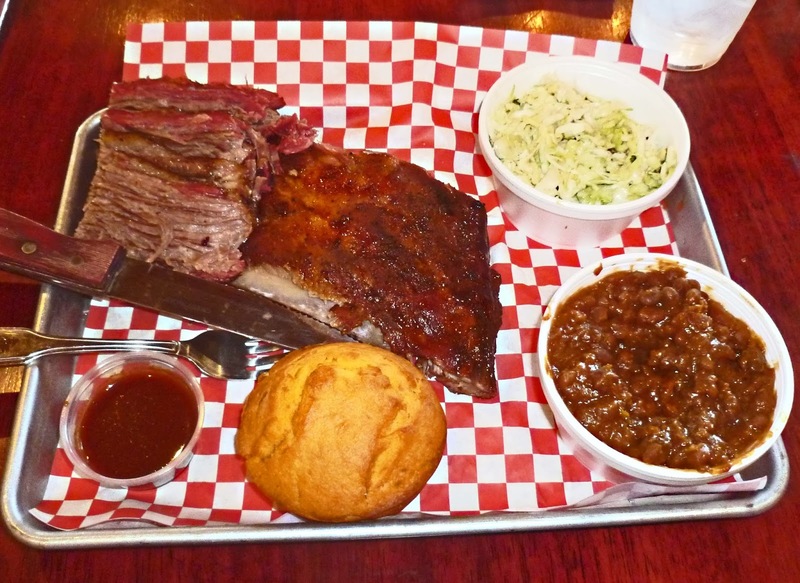 The interior is small and intimate with Mark's humorous bbq rules posted on the wall. 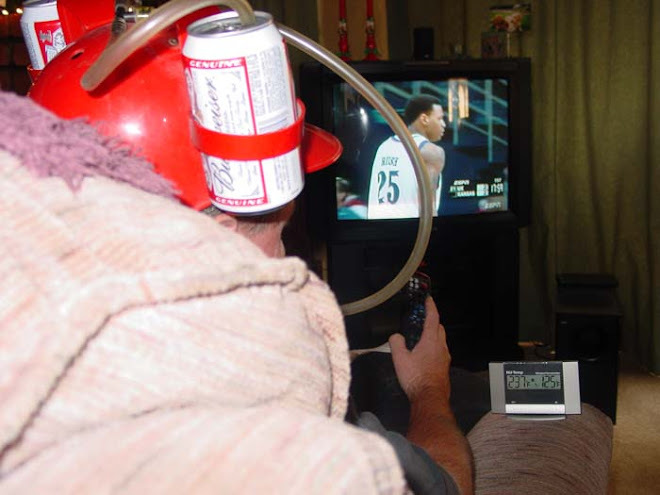 Several televisions are there for the sports crowd. I place my usual order for brisket and ribs. Mark and I converse about the bbq scene while the meal is prepared. He tells me that all his meats are smoked with apple wood. All the side dishes and the sauce is made from scratch. He also tells me that the wings are very popular. Hey, I forgot to order wings. Mark tells me he will let me sample a few. Mark is also an accomplished Chili Cook-off competitor. We have a lot to talk about. The food arrives just in the nick of time because I may have started to drool just a little. The brisket has a beautiful smoke ring. The ribs are falling apart tender. They both are seasoned with a non-assertive dry rub. I take a bite of the ribs and immediately taste beautiful, comforting, and tasty apple wood smoke. It is not overpowering, but a flavor that we crave. The brisket also has just the right amount of smoke and is falling apart tender. 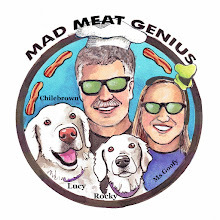 The flavor and smoke of these two meats made me swoon. This plate was all about the meat. The sauce that accompanied was thin vinegar and seasoned tomato slurry for dipping. My choices of sides were Cole Slaw and beans. Mark's expertise is chili making was apparent. They were very tasty and hearty. The slaw was refreshing with its sweet vinegar bite. A freshly baked corn meal muffin was the topping on this cake. I almost forgot about the wings. Mark has a special cooking process for these popular chicken snacks. They are brinned over night in a special solution. They are then baked briefly. 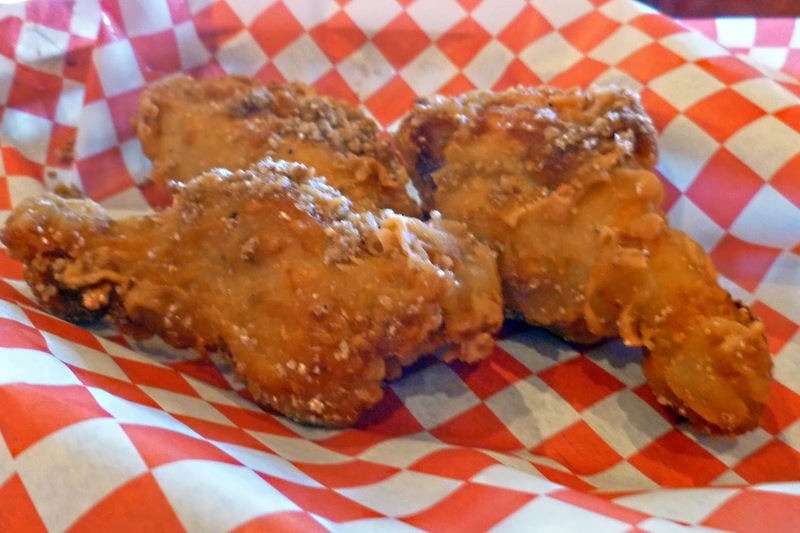 The wings are dipped in a seasoned tempura batter and fried. Seasoning flavors are then added such as: bbq, buffalo, tamarind and Parmesan. I had the Parmesan and was very pleased. These wings were huge. They were meaty, beaty, big and bouncy. Juicy, tender and I would never guess they had a bath in the fryer.The tempura batter dusted with Parmesan was a salty crisp flavor bomb. Oh my!!!!! We enjoyed our meal at Smoke N' Wings. Come for the BBQ and stay for the Wings. Everything looks extraordinary. The wings sound uniquely splendid. Now you've done it Chilebrown. I am going to have to make some wings this weekend. Chris, At one point in my life, I actually liked and went to Taco Bell. Not any more. Greg, These were no ordinary wings. They were huge. Three Dogs BBQ, Wings are made for snackin while watching football. Go for it.